Mathematical models of reverberation generate predictions of boundary and volumetric reverberation using the physical models of boundary and volumetric scattering strengths developed in Chapter 8. The development of reverberation models has proved to be formidable for two reasons (e.g. Moritz, 1982; Goddard, 1993). First, there are theoretical difficulties in solving complex boundary value problems for which analytical tools are poorly developed. Second, there are practical difficulties in identifying and measuring all the parameters affecting the reverberation process. 1 If d ^ X, the pressure of the scattered sound is proportional to f2 (where f is the acoustic frequency) and to the volume of the scatterer, regardless of its shape (Rayleigh's law). 2 If d « X, the pressure is a complicated function of frequency and also varies with the acoustic properties of the scatterer together with the characteristics of the ocean medium or boundaries. 3 If d ^ X, the scattering is independent of frequency and depends only on the acoustic properties of the scatterer and its cross-section (geometrical acoustic scattering). This situation has, in part, encouraged the development of two different approaches to the modeling of reverberation in the ocean: cell-scattering models and point-scattering models. 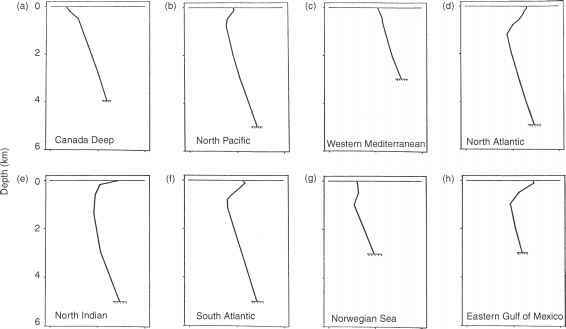 Cell-scattering models assume that the scatterers are uniformly distributed throughout the ocean. Thus, the ocean can be divided into cells, each containing a large number of scatterers. Summing the contribution of each cell yields the total average reverberation level as a function of time after transmission. A scattering strength is used per unit area or volume, as appropriate. This approach is the one most commonly used in sonar modeling. Point-scattering models are based on a statistical approach in which the scatterers are assumed to be randomly distributed throughout the ocean. The reverberation level is then computed by summing the echoes from each individual scatterer. This approach is particularly well suited, for example, to under-ice modeling. Reverberation is a time-domain problem. Reverberation levels can be represented as a function of range from the receiver by identifying the reverberation level corresponding to the time after transmission that the leading edge of the backscattered signal arrives at the receiver. The TL component of many reverberation models is based on ray-theoretical considerations. Models based on wave-theoretical considerations are usually not well suited to calculations at the high frequencies associated with traditional sonar applications because of the required computational time (Chapter 4, Section 4.9). However, for modern low-frequency applications, wave-theoretical techniques have been used with some success. For example, normal-mode techniques have been used to model reverberation in oceanic waveguides (Bucker and Morris, 1968; Zhang and Jin, 1987; Ellis, 1993), and a two-way parabolic equation model that computes backscattered energy (Collins and Evans, 1992; Orris and Collins, 1994) has been used in reverberation simulations (e.g. Schneider, 1993). LeMond and Koch (1997) developed a normal-mode scattering formulation that was useful in computing single-frequency bottom reverberation for bista-tic and monostatic scattering geometries in both shallow- and deep-water environments. Reverberation models are typically combined with environmental, propagation, noise and signal-processing models to form a new class of models referred to as active sonar models (see Chapter 10). In the analysis of sonar performance, reverberation and ambient noise are jointly considered as the background masking level against which a signal must be detected. In many situations, it is useful to understand which contributor (noise or reverberation) is most responsible for creating the interfering background. Such diagnostic information can be used to improve new sonar designs or to optimize the performance of existing sonars. Figure 9.1 Averaged reverberation (surface, bottom, volume and total) levels versus range as predicted by a reverberation model. The noise threshold is also plotted for comparison (adapted from Hoffman, 1979). array after bouncing off the target at the specified range. The plotted reverberation level is averaged over pulse length and corrected for processing gain. This corresponds to reverberation in the receiver bandwidth at the output of the signal processor before the thresholding device. Each of the bottom, surface and volume components of reverberation is the incoherent sum of the respective intensities derived from ray tracing. The noise threshold displayed on the reverberation plot is the combined ambient noise and self-noise in the receiver bandwidth at the output of the signal processor. In this example, the noise threshold is calculated by correcting spectrum-level noise for array gain, bandwidth and processing gain. Thus, the range (time) at which the background-masking level changes from reverberation-limited to noise-limited can be determined. A numerical method known as transmission-line modeling (TLM) has been used to model the scattering of acoustic waves off underwater targets. This method models the target and propagation space using meshes, rendering the problem discrete in both space and time. The mesh method models target features in considerable detail, operates readily in both two and three dimensions, and is capable of dealing with complicated scattering processes (Orme et al., 1988). The method has already found use in volume-scattering modeling, and in modeling time-varying propagation phenomena in multi-path channels. It is now also being applied to transducer structure modeling (Coates etal., 1990). A combination of the boundary element method (BEM) and wavenum-ber integration (WI), referred to as the hybrid BEM-WI approach, has been used extensively in the seismic community to model elastic-scattering problems. Wavenumber integration reduces the 2D Helmholtz equation to a 1D ordinary differential equation in a range-independent environment. BEM combines an integral representation of the wave field in a volume with a point representation of stresses and displacements on the boundary between fluid and elastic media (Schmidt, 1991). Keiffer and Novarini (1990) demonstrated that the wedge assemblage (or facet ensemble) method offers a unique description of sea-surface scattering processes in the time domain by allowing for separation of the reflected and scattered components. Jackson et al. (1986) applied the composite-roughness model (Chapter 8, Section 8.3.1) to high-frequency bottom backscattering. Lyons et al. (1994) enhanced this model by incorporating the effects of volume scattering and scattering from subbottom interfaces. A new bottom-scatter modeling approach was proposed by Holland and Neumann (1998) to account for artifacts observed in field data when the subbottom plays a role in the scattering process. Gostev and Shvachko (2000) considered kinematic models of volume reverberation caused by scattering from different types of inhomogeneities in the caustic zones of a surface waveguide. This reverberation component is important because the scattered field contains information on the statistical parameters of the inhomogeneities, including the location of caustics in the insonified zones. Ellis (1995) built upon the method of Bucker and Morris (1968) for computing shallow-water boundary reverberation using normal modes to calculate the acoustic energy propagating from the source to the scattering area and back to the receiver. Ray-mode analogies and empirical scattering functions were used to compute the scattered energy at the scattering area. Continuing along this line of investigation, Desharnais and Ellis (1997) developed the bistatic normal-mode reverberation model OGO-POGO, which is a further extension of the method of Bucker and Morris (1968). The propagation was described in terms of normal modes computed by the normal-mode model PROLOS. Travel times of the reverberation signals were derived from the modal-group velocities. Volume reverberation from either the water column or the subbottom is not currently included, but boundary reverberation is computed using empirical scattering functions and ray-mode analogies. The OGOPOGO model was used to interpret reverberation measurements from shallow-water sites in the frequency range 25-1,000 Hz. 1 Straight-line propagation paths, with all sources of attenuation other than spherical spreading neglected. 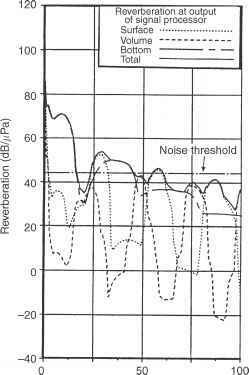 The effect of absorption on the reverberation level can be accommodated. 2 A homogeneous distribution of scatterers throughout the area or volume producing reverberation at any given time. 3 A sufficiently high density of scatterers to ensure that a large number of scatterers occurs in an elemental volume (dV) or area (dA). 4 A pulse length short enough for propagation effects over the range extension of the elemental volume or area to be neglected. 5 An absence of multiple scattering (i.e. the reverberation produced by reverberation is negligible). In the following sections, basic theoretical relationships will be developed for volume and boundary reverberation, as adapted from Urick (1983: chapter 8). Figure 9.2 Geometry for volume scattering. where the range extension (ct/2) is small compared to the range r.